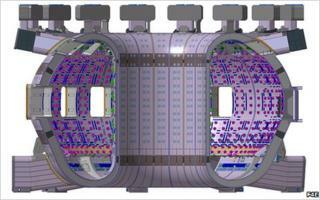 A plan to rescue European financing of the Iter nuclear fusion reactor project has been rejected at the final hurdle. Member states had wanted to reallocate 1.4bn euros from the existing Brussels budget to cover a shortfall in building costs in 2012-13. But the European Parliament has refused to approve the plan. Member states will now have to table a new proposal for early next year but access to the EU's 2010 budget is now closed. Iter's director-general Osamu Motojima is due in Brussels tomorrow for critical talks with officials from the European Commission. The multi-billion-euro facility, which is already under construction in France, will attempt to harvest energy by exploiting the same nuclear processes that power the Sun. "We had the green light of the Council of Ministers, but the Parliament did not follow," said Michel Claessens, a spokesperson for the directorate-general of research at the European Commission (EC). "The commission will put forward a proposal for the budgetary resolution of Iter next year." Under the plan agreed by member states in July, the EU was to have met a critical short-term hole in Iter financing of 1.4bn euros. Funds to cover this shortfall were to have been drawn from unspent funds and from its current research budget (the Framework Programme 7). But closure of the 2010 budget means this financing plan will have to be revised if and when a new proposal is tabled next year. The original plan for Iter, construction of which began in 2008, was to build the experiment within 10 years, at a budget of 5bn euros. But a range of issues, from technical to personnel matters, have conspired to inflate Iter's final price. Many commentators now expect it to be in the region of 15bn euros. Europe is responsible for 45% of the total cost, which the European Commission says will amount to 6.6bn euros. Iter's six other partners - China, India, Japan, South Korea, Russia and the US - are each contributing 9% of the final cost. Iter is not expected to begin operations until much later this decade. Even then, these will be shake-down tests; full fusion power will not be achieved until the 2020s. In a fusion reaction, energy is released when light atomic nuclei - the hydrogen isotopes deuterium and tritium - are fused together to form heavier atomic nuclei. To use controlled fusion reactions on Earth as an energy source, it is necessary to heat these gases to temperatures exceeding 100 million Celsius - many times hotter than the centre of the Sun. Is fusion power really viable?